The Heavenly House is a very luxurious modern villa. It is situated 100m from the sea and has uninterrupted sea views from all rooms. The villa has it's own private pool and a children's pool with contemporary water feature. It has a marble terrace and a wooden terrace. The ideal location for a BBQ and a glass of wine. There are 3 bedrooms with en-suite bathrooms. Air-conditioning throughout and private parking. The villa provides the ultimate in holiday accommodation. I live in Belgium with my husband. We spend most of our holidays in Turkey, where we have made many friends and have really fallen in love with Kalkan area. We love Kalkan because of the fantastic facilities in the area. There are some beautiful beaches and Kalkan centre boasts a great range of bars and restaurants. The amazing view, the quiet area, the excellent food. Each bathroom has a shower and toilet. Open-plan living space with dining and living areas. Marble dining table with 6 chairs. Lounge with 3 seater sofa and two 1 seaters in. TV with Satellite receiver, DVD/CD player with surround sound. Wireless internet acces. Fully equipped kitchen with granite work surface, hob, oven, fridge/freezer, microwave, dishwasher, cooker, kettle. Dining area with large table. Notes on accommodation: All rooms are air-conditioned. A welcome pack and information booklet with emergency numbers and contact details are provided. The marble flooring inside and out becomes slippery when wet, please take special care, particularly families with very small children and the elderly. We have also provided a cot and high chair for families travelling with young children. Free wireless internet available. Guests are asked not to smoke in the villa. Outside: There are 6 sun loungers, 2 sun umbrellas, 2 separate dining tables with 6 or 4 chairs, BBQ. The private infinity pool and children's pool are constructed in turquoise mosaic tiles. The pools can not be heated. There is an external shower for use before and after swimming. Utility Room: Washing machine, large fridge/freezer, iron and ironing board. Cleaning / Towels / Linen / Maid service: All linen and towels are provided. The villa is cleaned prior to and after a weekly stay. For those staying two weeks there is a full sheet change and clean after 7 days. The pool and terraces are cleaned daily. Maid service available on request. Other: 2 car parking spaces. Our 14 days staying at Heavenly House can only be described as magical. The situation of Heavenly house and the views were superb with two of the beach clubs easily accessible and very convenient. The area offered us eating out options without having to drive into Kalkan town and a convenience store a short walk away. Our whole experience from booking with Hilde, to liaising with Huseyin and Daisy were nothing short of professional and friendly. NB: As you know South Africans pride themselves in their BBQ skills, but Huseyin and Daisy, "The Castle" your Tuesday BBQ exceeded our expectations by far. It was our pleasure to host your family! Hope to welcome you again sometime. 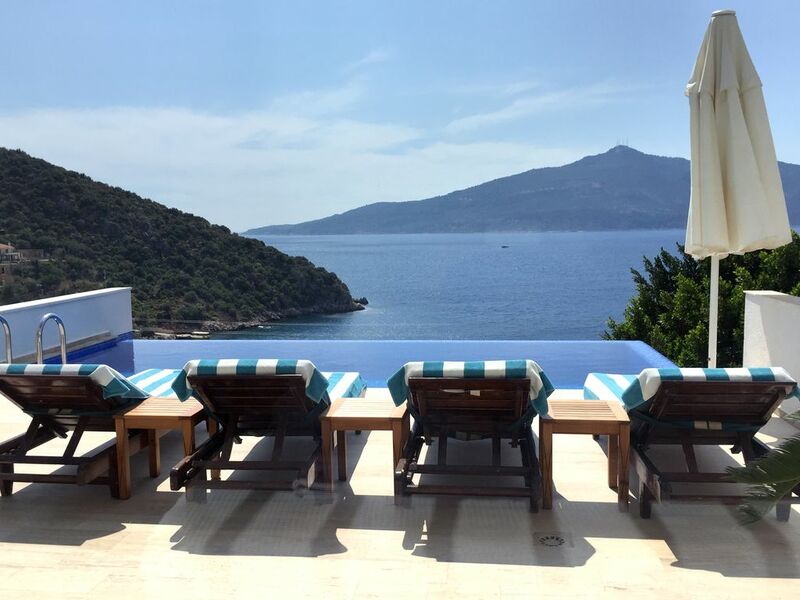 Fabulous views and best location in Kalkan. The villa is well equipped and there are fabulous views from the glass walls in the lounge area. The infinity pool is small but as two sides are infinity it seems much bigger when your in. It’s a short walk to Kalkan Beach Park and a shorter walk to the Castle restaurant. The Castle is owned and run by Daisy and Hussain - your local hosts for this villa - and we ate there a couple of times - good food and a great option if you don’t fancy the trek into town. Our only criticism was that the upside-down nature of the villa can be inconvenient if you are having a day relaxing round the pool. The best villa we ever stayed in. This villa lives up to it’s name. If you like the charmingly maverick, this property certainly fits the brief as it is a clever, upside down house that works perfectly in the Turkish climate. Off road parking (always a bonus) leads down to an entrance hall with a water cooler, and further fridge/freezer, (genius, near the bedrooms and pool terrace!) two cool, ensuite double bedrooms each with picture French windows leading directly onto the pool terrace itself, which has comfortable, shaded outdoor seating, as well as sunbeds, all at the side of the infinity pool. Infinity continues with uninterrupted views of the the whole of Kalkan’s unique bay, itself within walking distance. Upstairs is simply breath taking. A huge light, airy, living/kitchen/dining area with a small additional terrace,(itself furnished with a further chair and tables) seems suspended in mid air, both affording more panoramic views as each with a sense of total space and calm. On the very bottom floor of this unusually appointed and well equipped villa (accessed by an outside staircase) is a further ensuite double room, a lovely shaded terrace with large table and chairs, children’s pool/grown ups lounging pool, which are out of the fierce afternoon sun, and wither bonus addition if an immense laundry/utility room and hanging area, an essential with lots of swimming gear and towels to keep dry. Set high in Kisla, which is a little bit out of the busy centre, yet within walking distance of a local shop, restaurants and two delightful beach clubs, this beautifully, maintained, unusual, well equipped villa really does deliver everything needed for a Heavenly Turkish holiday. Our stay here was just perfect. We absolutely loved our time there and the concierge, Daisy and Huseyin, were incredibly helpful and always available. The villa had everything we needed and we just loved the view. Thank you to the owner, Hilde, for this amazing holiday, we are very much considering returning next year. The villa is approx. 100m from the sea. Kalkan beach club is just two mins walk down from the villa. There is a boat service to the harbour. Otherwise you can hop on a dolmus (Turkish minibus) and head for either Patara Beach approx 20 mins 18km of sand, described as one of the most beautiful stretches of pure white sand in all of Turkey, or Kaputas beach an absolutely beautiful bay takes 10 mins. The nearest airport is Dalaman. From which is 1,5 hours drive to the villa. Transfers to and from the airport can be arranged. The driver will meet you at the airport and take you direct to the villa. Prices one way to or from Dalaman up to 4 pers with minibus : 70 TRY. Car hire is available from as little as £25/day and is recommended. Another possibility is Antalya Airport which takes approx 3 hours to Kalkan (220km). The nearest town to Kalkan is Kas, which does an excellent outdoor market. It takes 20 minutes by car and the coastline journey is breath-taking. Fethiye is a much larger port/city and is an hours drive. Sightseeing places such as Xanthos and Kekova are on the way to Fethiye, 35 minutes and 45 minutes respectively. The restaurants of Kalkan are superb, and there plenty to choose from. The shopping is fantastic, with beautiful silver jewellery shops and leather handbags... Credit cards or euro/sterling as well as Turkish lira are accepted in most of the town's shops and restaurants. There are 3 large supermarkets in Kalkan, offering a free delivery service, and 1 small supermarket within 2 mins walk of the villa. Market day is on a Thursday. The locals are incredibly friendly and most speak excellent English. Booking Notes: Should you wish to enquire, do not hesitate to contact us. We will endeavour to meet your needs and requirements. A deposit of 20% is required in order to secure the reservation with the balance payment due 6 weeks prior to departure. For late bookings, 100% payable at time of booking. We do not take a deposit for breakages but also ask you to treat the property as it's your own and with respect. Check in is after 16:00 and check out by 11:00. Can be flexible depending on bookings before and after your visit. Changeover Day: Changeover day is flexible but request that our guests vacate the villa by 11am on the day of departure unless otherwise agreed. Notes on prices: Prices are for the property per week in UK Pounds. Prices negotiable for long winter lets.